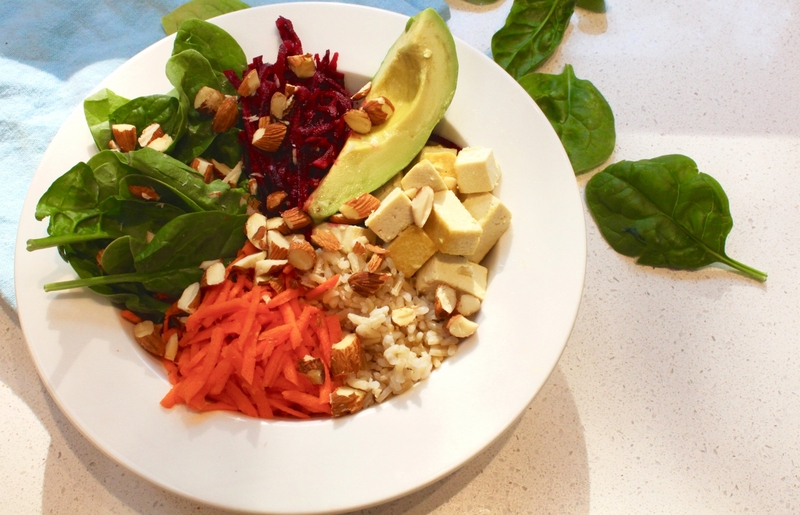 This bowl is such a welcome change to our usual dinner routine, whether we're in a mid summer melt-down, or feeling the mid-winter blues. I eat with my eyes and I love all the colours of this dish, which makes me think of sunshine! With all that colour comes loads of nutritients too - antioxidants such as vitamin C, beta carotene, and vitamin E; magnesium, iron, and zinc; monounsaturated fats; fibre; whole carbohydrates, and protein. This is a great way to experiment with tofu if you're new to it. I love tofu because it is such an inexpensive and versatile protein that is quick and easy. But also because tofu is made from soybeans which are a high quality, plant based protein source containing all essential amino acids. If you're not into tofu, by all means substitute it for a chicken breast or shrimp. But really, the best part of this dish is the miso dressing! Seriously. For those unfamiliar with miso, it is a fermented soybean paste similar to soy sauce but in solid form. It is a little less salty and creamier than soy sauce. 5. Top with a few tablespoons of miso dressing and enjoy!